Prepare to share a holiday of a lifetime with your loved ones! This large and luxurious 8-bedroom 9-bathroom estate comes with an endless list of pampering options: from stylish and comfy bedrooms to carefully thought out indoor and outdoor common areas, and even a game room. 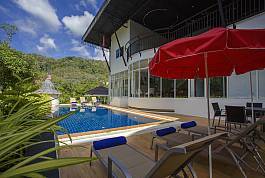 Located in a stunning jungle-laden location in the foothills of the Big Buddha statue at Chalong, this luxury 8-bedroom villa sits majestically in a scenic hillside position. The garden has a multi-level cascading design with grass lawns and tropical plants. There is a small poultry yard and fish pond, a wooden terrace, perfect for a romantic dinner looking towards the Big Buddha. The seascape of Phuket's, Rawai is pictured on hundreds of postcards, but the views caught from the balcony of Villa Hin Fa are even better. 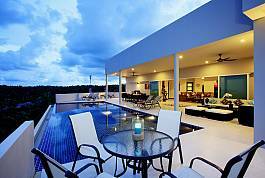 Elevated on a private drive in a gated community, this 8+ bedroom villa is truly a carefree paradise in Phuket. 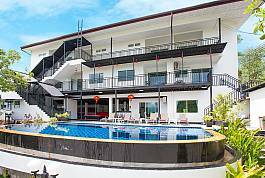 If you are floating in a private infinity pool and looking out over the serene paradise of the Rawai seascape, then you’re probably staying at Phuket's View Peche Villa. 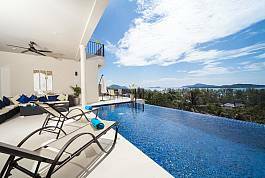 This stunning 8+ bedroom villa will allow you to experience Phuket from a perspective that few get the opportunity to appreciate.